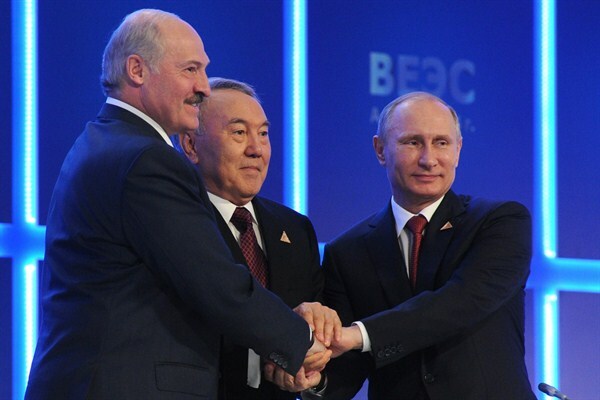 Russian President Vladimir Putin, Kazakh President Nursultan Nazarbayev and Belarusian President Alexander Lukashenko after signing an agreement to create the Eurasian Economic Union, Astana, Kazakhstan, May 29, 2014 (AP photo by Mikhail Klimentyev). The war in Afghanistan has been both a boon and curse for neighboring Central Asia. The conflict placed this sparsely populated region, long disconnected from the globalization taking place around its borders, on the front lines of the international community’s 15-year effort to stabilize Afghanistan. Central Asia became a staging point for coalition military forces, a transit corridor, a donor as well as a recipient of aid and at times a pawn in a larger strategic competition playing out between the United States and Russia. The region also found itself on the receiving end of Afghanistan’s noxious exports: extremism, drugs and crime.